We are constantly bombarded with images of what perfect motherhood looks like. Magazines and Martha Stewart have always made us feel like holiday slackers for not being able to follow their “easy” guides for the best holiday ever. It has only gotten worse in the past few years with Pinterest boards full of “normal” families living in perfectly decorated and organized homes. Their meals are all cooked from scratch with organic produce they grew themselves. The family schedule is packed with elaborate craft projects and incredible activities to “enrich” their children. 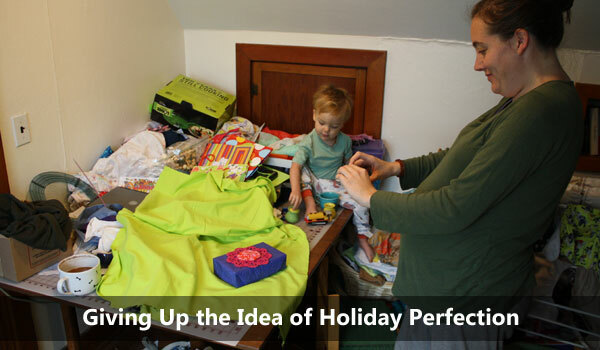 The holidays increases the pressure to step up and create a fairy tale season for your family. Thousands of perfectly decorated cookies, handmade presents, kids’ holiday themed lunches and art projects. It’s no wonder so many moms feel guilty about not being able to live up to this ridiculous image of perfection and stress out trying to match it. This holiday season, let’s give ourselves a gift! The following are are a few ways to give up the mommy guilt and stop trying to attain something impossible. Stop Comparing: When you look at all the pictures of these perfect houses, remember they are a stage. They have hidden the load of laundry that needs to get done behind the couch, or shoved all the clutter in the closet. The family of the mom with the perfectly organized pantry ate frozen pizza three times this week. That mom who baked those beautiful cookies? She hasn’t managed to change out of her yoga pants in a week. It is easy to imagine that these images belong to people who have perfect lives, but the truth is they have their problems, and complications that just aren’t shown in the pictures. Stop Stressing: Take a deep breath and relax. Family memories are made up of the little moments that are special, the togetherness, the funny things that happened. They aren’t going to remember how many sides you served, or how many hours you spent on the centerpiece. All the little details are not important. What matters at the holidays is the time spent together, and sometimes those times when nothing goes right, those times end up being the most cherished and memorable holidays. Simplify: Instead of stressing out trying to bake ten types of cookies, just make your family’s favorite two. You don’t need to try five new recipes at Thanksgiving or attend every holiday event in town. It’s better to do a few things that are meaningful and special with your family than to try to cram the holiday season full of things you think you should be doing. Talk to your family to find out what their favorite part of the holidays is and which parts are not so important to them. If no one likes green beans, skip making them this year, and use that time to make whipped cream from scratch for the pumpkin pie that everyone loves. Often times it is the little things that mean the most to your family. Share: Traditions and holidays are all about family, so share the work. Let your family be part of the preparation. Let go of the idea of perfection. Sure, cookies decorated by kids might not look “perfect.” Maybe your husband won’t fold the cloth napkins the exact same way you would, but what matters is they are actively being a part of the holiday, not just bystanders.